Curated by Riyas Komu, this street art project will showcase 4 street artists from across the world who will come together to explore certain streets and spaces of Panaji, Goa. Open Site is a suggestion towards dissolving boundaries – between nations, states, and more importantly, between people and art. 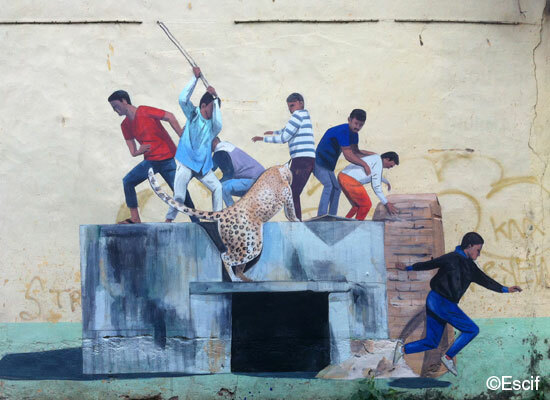 By bringing international street artists to the state of Goa, this project aims to make an intervention that allows the public to imagine their lives in a broader socio-political domain. Open Site will also project urban space as a place of reflection by adding value to the mundance corners that are overlooked everyday, thereby allowing the possibility of interweaving new narratives through the city. Escif: A graffiti artist who wants people to not only appreciate the aesthetics of his art, but also the messaging behind it. Faith47 : An internationally acclaimed street artist who questions and addresses the complexities of the human condition. Her art makes you dig deeper, and poses existential messaging aimed at social awareness. Nemo : This Italian artist churns out the most thought provoking motifs you will see. His public pieces question the cultural norms of modern day society. Hanif Kureshi: Part time designer, full time typography preserver! Hanif has always been fascinated by street art. Although he is a designer by day, he expels whatever time and energy he has left towards preserving the typographic practices of Indian street art.